A shorter life-span of the fans. The electrical power to do this should be within a range of 35 – 45 watts with most modern HRV units. 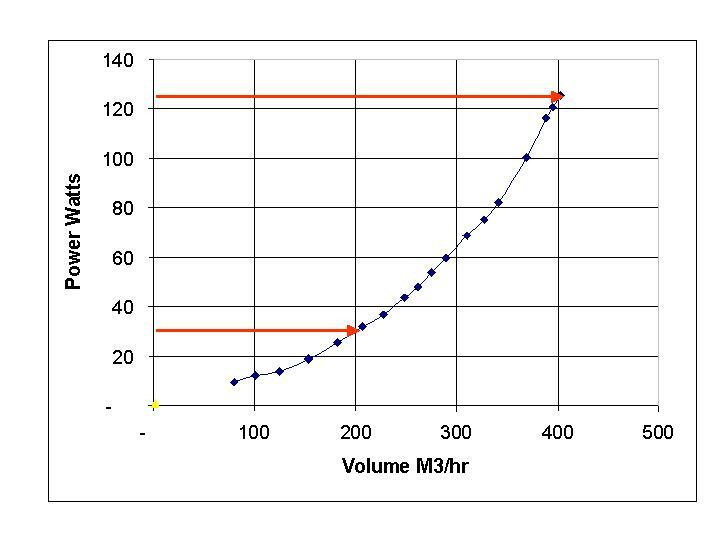 The same unit, serving a house 800m3 in volume, will need to move 320m3/hr. and will use 70 – 80 watts. This represents a power increase of 90% for a size increase of 33%. ProAir Systems measured the power used by its ProAir 600 unit to move different volumes of air. The results are shown in the graph below. The unit uses considerably less power on a proportionate basis when smaller volumes of air are being moved. Correct sizing of the unit for the application ensures that the motors driving the fans, which are running continuously, are within their comfort zone. This allows them to run very efficiently at lower speeds. 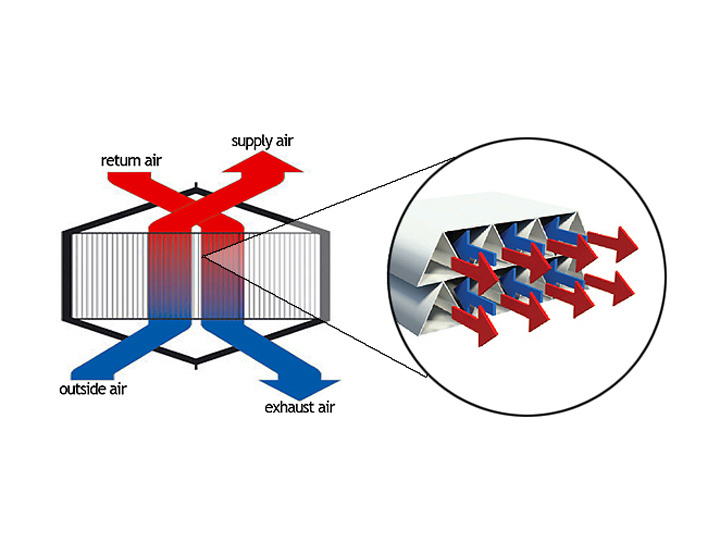 The object of the exercise is to move the required amount of air at the lowest fan speed and hence achieve high efficiency with the resulting low sound levels. In order to achieve this, it is necessary to have a low resistance ducting system. This is best obtained by using high quality rigid duct. The inside is smooth and this facilitates the easy movement of air. The low resistance is crucial in achieving low running speed and the associated high fan efficiency. If duct diameters are too small, or if routes are too convoluted and longer than necessary, a slight pressure will build up in the duct. This will then have to be overcome by the fans. Overcoming this pressure will involve higher speed and more electrical power. An acceptable duct pressure will be in the region of 15 pascals during normal running speed. At higher speeds when the system is boosted the pressure in the duct system will increase dramatically increasing power consumption. This is acceptable as the high speed is usually only used for short periods during the day such as showering. This combination of a low normal speed and the occasional high-speed operation for short periods during shower usage etc. will ensure that the air is totally changed in the house ten to twelve times in a twenty four hour period. In houses that require say 400m3 of air to be moved every hour, the question of using a second unit must be considered. From a power consumption point of view our test results in the table above show that two units using 31.92 watts each, would be a much better option than one unit using 125.4 watts. The unit running at 206m3/hour will be considerably quieter in operation than one delivering almost twice the volume of air. As it is more efficient in converting electrical energy into work energy, less waste heat is generated on the windings of the motor, resulting in longer life. Using two units at low speed means that there is adequate capacity available to boost the system when necessary. As energy prices increase, the payback period for the second unit will be reduced accordingly. Furthermore CO2 emissions will be lower when two units are used. ProAir uses only the highest quality counter-flow plate exchangers, made from pure polystyrene sheets, one fifth of a millimeter thick. Pure polystyrene has efficiency advantages for this application over the more traditional aluminum exchangers. As aluminum is a metal and is a better conductor of heat than polystyrene. It is most important to have heat travel across the thickness of the plate. It is actually disadvantageous to have heat travel along the plate. In this setup the polystyrene performs better. The reason it is a disadvantage to conduct along the plate is that a totally efficient exchanger will have the end with the cold air entering at the temperature of the cold air and the end with the warm air entering at the temperature of that warm air. This cannot happen with a metal exchanger, as there will always be lateral conduction, especially when there might be a temperature difference of 40o C across it.